This Feb. 9, 2013 file photo shows actor Rupert Grint at the photo call for the film "The Necessary Death Of Charlie Countryman" at the 63rd edition of the Berlinale International Film Festival in Berlin, Germany. Grint, who played Ron Weasley in the Potter film franchise, will make his Broadway debut alongside Nathan Lane, Matthew Broderick, Stockard Channing, Oscar winner F. Murray Abraham and Emmy winner Megan Mullally in the Terrence McNally's Broadway-bound revival of "It's Only a Play." Producers of Terrence McNally's Broadway-bound revival of "It's Only a Play" have added a little "Harry Potter" magic — Rupert Grint. 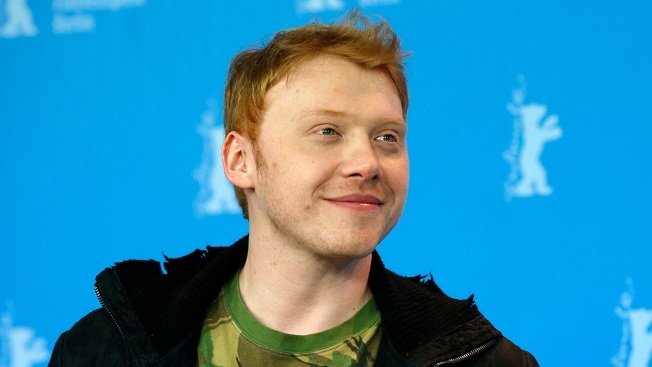 Grint, who played Ron Weasley in the Potter film franchise, will make his Broadway debut alongside Nathan Lane, Matthew Broderick, Stockard Channing, Oscar winner F. Murray Abraham and Emmy winner Megan Mullally. The revival will play at the Gerald Schoenfeld Theatre. Opening night is Oct. 9. "It's Only a Play," which previously appeared off-Broadway in 1986, is a send-up of show business. It is set on the eve of a play's opening night and its anxious playwright has to deal with Broadway show business types as they await the first reviews. Jimmy Fallon and announcer Steve Higgins move "The Tonight Show" to The Wizarding World of Harry Potter in Orlando, Florida. Grint made his West End Debut in the 2013 revival of Jez Butterworth's "Mojo."